After publishing “The Solaris Book of New Fantasy” edited by George Mann in 2007, Solaris Books will release on May a new anthology of fantasy fiction, edited by Jonathan Strahan and entitled “Fearsome Journeys: The New Solaris Book of Fantasy”. 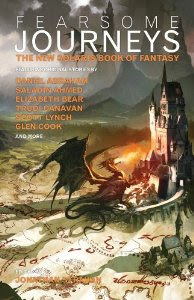 “The Solaris Book of New Fantasy” was a very strong anthology, featuring stories by some of the best authors of speculative fiction such as Conrad Williams, Steven Erikson, Lucius Shepard, Mark Chadbourn, Hal Duncan or Jeff VanderMeer. That anthology is one of the perfect examples of what magic and power fantasy fiction can hold. It is one of the numerous reasons for which I love the genre with passion. But there are plenty of other reasons for which I love fantasy with passion and among them I can count Elizabeth Bear, Trudi Canavan, Daniel Abraham, Jeffrey Ford or Glen Cook, authors who will havestories in the upcoming Jonathan Strahan’s “Fearsome Journeys: The New Solaris Book of Fantasy”. And when the collection is described as “an anthology of adventure fantasy, with a slight emphasis on military fantasy and swords and sorcery” I guess I can’t ask for more. But I do must admit, this anthology had me at K.J. Parker, one of the most talented authors of the genre and one of my top favorite writers. I'm looking forward to snagging this collection when it comes out. I don't always agree with Jonathan Strahan's selections but he consistently puts out high quality anthologies. I don't believe I've read any of Parker's work. I did download a KJ Parker book to my Kindle that was up free the other day, Farewell Horizontal is its name, I believe. Lots of great authors on this list and some I'll be reading for the first time. Carl, K.J. Parker has a unique voice and one of my favorite writers because of it. I read only one anthology edited by Jonathan Strahan and indeed it was very good. I am looking forward to see what it makes with this one, because you are right, there are some great authors on the line-up.